Designed for local, independent pizza restaurants who are producing top-quality meals to compete with the big chains by offering what today’s pizza-hungry customers want . . . ordering convenience. One of the big trends in the online space in 2019 will be the emergence of niche turnkey website hosting. While not brand-new there’s been a major advance in WordPress Multisite software that has enabled web developers to offer professional quality, responsive websites that can be configured within minutes. 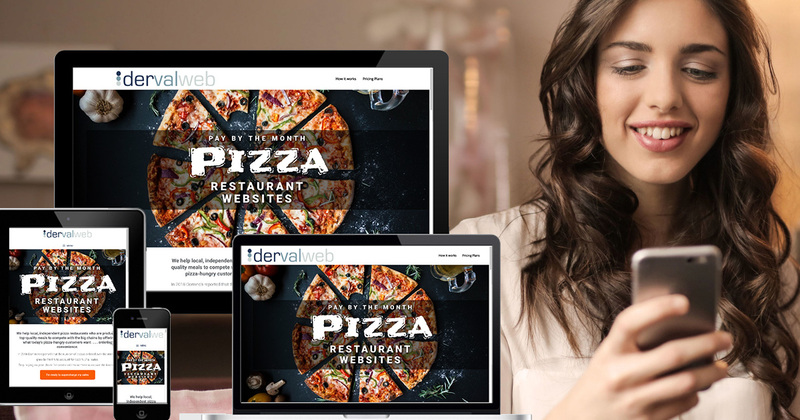 We have introduced dervalweb.com.au as our first foray into the turnkey space choosing the independent Pizza Restaurant industry as our niche. The fast food industry in Australia is dominated by large multi-national chains who have significant investment capacity. They have invested in technology that allows customers to create their own meal orders using a web page or app and submit and pay online via credit card. Dervalweb turnkey sites include a robust ordering system that allows small local operators to offer the same functionality to their customers. In 2018 Domino’s reported that the number of pizzas ordered over the internet grew by 19.4 % to account for 63.9 % of all sales. It stands to reason that independent Pizzerias can also share in the benefits of this trend. The system is fully configurable to allow for extra toppings to be added, build your own from scratch and display food allergy messaging where required. The opening hours are set which means that orders can only be submitted while the business is open. Delivery policy is also set specifically for each business. Orders are sent immediately via email, so Pizza takeaways need to have access to an internet accessible device such as a laptop or more likely tablet or smart phone. Customers are required to enter their phone number (for order confirmation if required) and email for confirmation, communication and possible future marketing. The system has a robust reporting module that shows product sales performance and customer reporting. Who does this suit best? Businesses best-suited for this product are Pizza Takeaways that either don’t have a website already or have one that only displays a static menu and price list. Keeping prices, sizes, product range and special deals updated on a static website is very time-consuming so having a dynamic online menu is a huge benefit. Business owners can reduce the pressure on their front-of-house staff taking phone orders and achieve more sales by going online. Offering customers the convenience of ordering via the internet may also steal them away from the big chains who have had online ordering for some time. EatNow Affiliate Program are an arm of Menulog which is a very large multi-national online food ordering network. Rather than build your own website they host your menu, provide the technical order form, process the payments and send the order to you for fulfilment. They retain 2.5% of the total order on each transaction. Online Food Express operate in the same way as EatNow however this is an Australian company. They don’t display their website prices or commission rate but is probably similar to EatNow. EatApp allow you to choose a template site and have quite a few bells and whistles. They have monthly website plans starting at $154 with no commission charges. Uber Eats charge restaurateurs 35% on every delivery made which leaves businesses very little margin for profit (if any). It’s important to note that all online payment gateways charge credit card processing fees which may be annoying but it delivers a significant benefit to independent businesses by not having to deal with privacy and credit card number security. This is handled by the 3rd party payment gateway companies. Our dervalweb hosting offers an Essentials Plan for $85 per month (no payment gateway) and a full e-Commerce Plan for $100 per month for Pizza Restaurants. There is no commission charged on sales so businesses retain their revenue less the unavoidable payment gateway fee per transaction. Business owners choose a plan that suits their business (eg. take online payments). Plans are pay by the month with no contracts or minimum periods. Both plans include a One-time setup fee of $350 which covers branding and menu and price list setup. The design work has already been done and is presented to businesses as templates. The templates have been built with responsive design in mind which means they display well on all devices including tablets and smart phones. The sites are deliberately small in size as the key purpose is to present the business brand and enable online ordering. Business owners add their name and ideal URL (or bring their own domain name with them) and pay by starting a monthly subscription via credit/debit card. Behind the scenes, the website is configured and a tailored Dashboard created where business owners can view guides, checklists and video tutorials and modify page content and styling if they need to. We ask business owners to send us their menu so we can enter their business details, add menu/price list, set opening hours and add delivery policy. We also tailor the business logo to best fit the chosen template and incorporate brand colours. We encourage Pizza Restaurant owners to take a look at what dervalweb.com.au offers for their busines. Perhaps you have a favourite pizzeria in your area that you think could benefit from online ordering so let them know to take a look and get in contact with us if you/they need more information.